Malala Yousafzai is no ordinary school girl. She lives in the Swat Valley in Pakistan where the militant Taliban has tormented all those opposed to their brand of Islam for years. They oppose education for girls and have burned down hundreds of schools in recent years. Malala’s father ran a school for girls for fourteen years. In 2009, it was closed along with many others. It was then that 11-year-old Malala became an activist for the rights of girls in her country. Her father told her that “Education is a light and ignorance is a darkness, and we musy go from darkness into light.” In Pakistan, 25 million children are out of school and the country has the lowest youth literacy rate in the world. Malala started her movement for girls’ education with a blog. She kept a diary for the BBC under a pen name about life under Taliban rule. Malala explained in an interview that “I wanted to scream, shout and tell the whole world what we were going through. But it was not possible. The Taliban would have killed me, my father, my whole family. I would have died without leaving any mark. So I chose to write with a different name.” In time, the Taliban were driven out of the area and schools reopened. In 2011, Malala won Pakistan’s highest honor for a civilian activist, the National Youth Peace Award. She has been nominated for other international awards as a child activist. 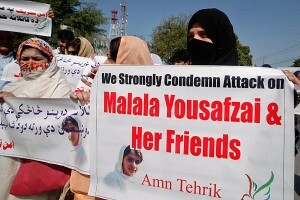 The Taliban considers her a symbol of Western culture and one that must be silenced. In July, 2015, Malala turned 18 and celebrated by opening a girls school for Syrian refugees in Lebanon. She commented that “we must invest in books instead of bullets.” In 2017, Malala turned 20 and was accepted at Oxford University in England. She plans to study politics, philosophy and economics.